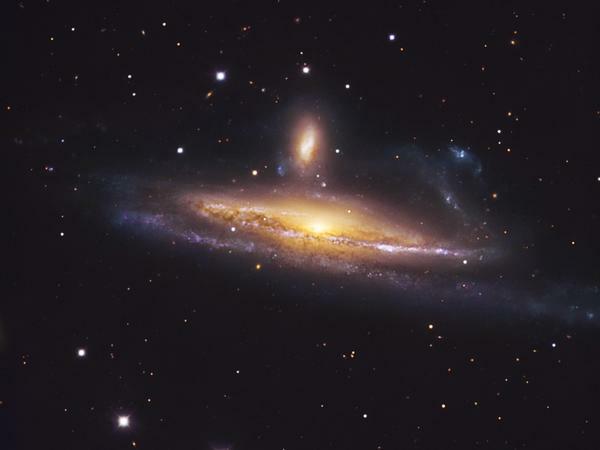 The pair of galaxies NGC 1531/2, engaged in a spirited waltz, is located about 70 million light-years away toward the southern constellation Eridanus (The River). And every time I give a public astronomy presentation, whether it's about black holes or the Big Bang or the Hubble Space Telescope, someone always raises the same issue. "Space is so big," someone will say. "Aren't we all insignificant?" Sometimes they'll even say, "It makes me feel kinda bad." The vast, huge, biggedy, bigness of the universe freaks a lot of people out. Just to be clear, space is pretty big. It took 10 years for last summer's New Horizon probe to cross the solar system and reach Pluto, even though it was speeding along at 36,000 miles per hour. And Pluto is barely the cosmic version of next door. The Milky Way galaxy, which is kind of like our local city in space, has 400 billion stars — and they are so far apart from each other that even if you traveled as fast as New Horizon it would take 100 centuries to get from one star to another. And what's between all those stars? Well, on average, there's less than one atom of matter in each cubic meter of interstellar space. So yeah. Yeah. I get it. The universe is really big and really empty. But, my friends, I am here to tell you that is no reason to get all freaked out. Instead, I think it's reason to celebrate and that's the good news. Sure, space is unimaginably vast and you are just a tiny speck of speckiness in the vast wheeling cosmos. But does that mean you're insignificant and unimportant? Yes, it does — and that is awesome! Cause that means you're off the hook. Space is so crazy big that most of the day-to-day stuff we sweat just doesn't matter and that is a very good thing. Did your car get a flat on the way to work? Doesn't matter. Did you spill coffee on that new white dress shirt just before a meeting? Doesn't matter. Did you swipe right on Tinder 1,000 times and no one swiped back? Doesn't matter. It doesn't matter because the immense vastness of the universe can be a kind of gift reminding us all to chill out. The whole stage of our lives, with all its immense joy and sorrow, is really part of much larger and much grander play. Knowing the true scale of the universe doesn't have to freak us out. Instead it can remind us to do the best we can, to be careful, compassionate, give it all our effort and, then, step back. The universe is a big place and there is a lot going on. That means, at one scale at least, our problems just aren't that important. So, stop worrying so much and remember what the great sage Bill Murray told us in Meatballs, the immortal tale of summer camp: "It just doesn't matter. It just doesn't matter. It just doesn't matter." Now we're going to take a step back - a really, really, really big step back and consider how we fit in the universe. Actually, Adam Frank is going to consider that. He's our resident astrophysicist who blogs for NPR. ADAM FRANK, BYLINE: Does the size of space - those zillions of stars and zillions of miles of nothing in between them - does that freak you out? Well, if it does, guess what? You're not alone. I give a lot of public talks about the universe, really. It's in my job description. Astronomer, check. Study stuff in space, check. Give talks about the universe, check. And every time I give a public astronomy presentation, whether it's about black holes or the Big Bang or the Hubble Space Telescope, at the end, someone always raises the same issue. Space is so big, they'll say. Aren't we all insignificant? Sometimes they'll even say, it makes me feel kind of bad. The vast huge bigity bigness of the universe freaks a lot of people out. Just to be clear, space is pretty big. It took 10 years for last summer's New Horizon probe to cross the solar system and reach Pluto, even though it was speeding along at 36,000 miles per hour. The Milky Way Galaxy, which is kind of like our local city in space, has 400 billion stars, and they are so far apart from each other that even if you traveled as fast as New Horizons, it would take about a hundred centuries to get from one to the other. And what's in between all those stars? Well, in some addresses in interstellar space, there's only a few atoms in an entire cubic meter. So, yeah, yeah, I get it. The universe is really big. And it's really empty. But I'm here to tell you that is no reason to get all freaked out. Instead, I think it's reason to celebrate. Sure, space is unimaginably vast, and you're just a tiny speck of speckiness in the vast wheeling cosmos. But does that mean you're insignificant and unimportant? Yes, it does. And that's awesome because what that means is you're off the hook. Space is so crazy big that most of the day-to-day stuff that we sweat just doesn't matter, and that's a good thing. Did your car get a flat on the way back home today? Doesn't matter. Did you spill coffee on that new white dress shirt just before a meeting? Doesn't matter. Did you swipe right on Tinder a thousand times and no one swiped back? Doesn't matter. It doesn't matter because the immense vastness of the universe can be a kind of gift reminding us all to chill out dude. The whole stage of our lives with all its immense joy and sorrow is really part of a much larger and much grander play. Knowing the true scale of the universe doesn't have to freak us out. Instead, it can remind us to do the best we can, to be careful, to be compassionate, to give it all of our effort and then step back. The universe is a big place, and there's a lot going on. That means that at one scale at least our problems just aren't that important, so stop worrying so much. And remember what the great sage Bill Murray told us in "Meatballs," that immortal tale of summer camp. It just doesn't matter. It just doesn't matter. It just doesn't matter. BILL MURRAY: (As Tripper) It just doesn't matter. It just doesn't matter. It just doesn't matter. It just doesn't matter. RICK DEES: (Singing) Meatballs, meatballs, meatballs. Transcript provided by NPR, Copyright NPR.